Multi-level (we had 3rd floor) well-maintained clean motel situated amongst beautiful foliage with good-sized balcony, remodeled shower, good water pressure, mini fridge, safe, TV, wifi, small pool, hot tub, fan and A/C. Has a beach court yard with big trees and shower to wash off sand. Gazebo restaurant and bar by koi fish pond next to court yard. Beyond the court yard is beautiful 7-mile beach--soft powdery sand, clear shallow water, no seaweed, great views both directions. Lifeguard on duty. No currents. Few locals walking by with dogs, few horses running by. Few boats troll by looking for customers. A few more vendors than I would have liked. But not persistently annoying. The staff were friendly but a little slow (laid back). Food was decent. We had our coffee out on the beach. The only nasty thing about this place were the ants (2 varieties) that bit me both at the bar and the tables next to the bar. No ants on the beach, though, which is where we spent most of our time. The staff were amazing - from front desk to wait staff, to lifeguards. Everyone tried their best to accommodate us in the most friendliest and efficient manner. Rooms were very clean and hotel food was delicious. The greatest part was the ability to walk out of my room and in a few feet I'm on the beach! Everything you want is on the beach - food, tropical fruits, shops, boat riding, parasailing, and sooooo much more. If you want a break from the hotel restaurant you can get jerk chicken or patties off the street, along with a variety of other local restaurants on the strip. I cannot wait to go back. I discovered that $580.00 in U.S. dollars was missing from the locked safe that I rented and prepaid for at the hotel. Thought this establishment was secured and safe but evidently the hotel management/owners have thieves on their payroll. The disgust that is left in the pit of my stomach has made me decide to never step foot in Jamaica ever again. Wonderful stay at a great price! The wife and I enjoyed the distance from larger, overcrowded areas and would definitely stay again! Really good option for reasonable price. Rooms are comfortable and clean. Good restaurant. Beach is small, however good sand and water. Had a great time ,staff was very friendly and informative and pleasant . I always enjoy my stay at Rondel Village. Rooms are clean. Housekeeping is always available to get me what i need as far as towels, soap etc. Hotel staff are also very helpful in assisting me with my needs. I would definitely stay there again and recommend this place to others. I love that its right on the beach. So just to let you know my background, I've been to Jamaica 4 times, and I stayed at an all inclusive twice (Sunset Beach & Secrets) and this is my second time at Rondel. I came back to Rondel mostly because I felt safe. They have 24 hour security, the staff is extremely friendly and helpful (it doesn't hurt that they remembered me from last time), the food is good (a bit overpriced in my opinion), and it's in close proximity to the night hot spots. Be warned that Jungle Nightclub is directly next door and if you don't like loud music throughout the night you might have a problem. Also, there are a lot of beach vendors, security is very good at keeping them a bay so you don't feel overwhelmed. And double shout out to the bartenders Donovan and Delroy. They are absolutely amazing! I was impress with hotel. I stayed on the garden side and the rooms are big, clean and up to date; however I was not happy with the water. The water pressure needs some improvement and get ready because you might get startled when the water temperature changes. Chill there but then explore everything else that Jamrock has to offer. Do the tours. Centrally located on the 7mile stretch. Right next to Jungle nightclub if you're into that... also close to Roots Bamboo and Alfred's. Staff is wonderful. We met Antonica, Rachel, Delroy among many. The security guards were also great. Front office staff were helpful too. There was one girl who wasn't very friendly but overall good. Do try Dirty Banana. We had this at many different bars and this was best here. Get it with Wrey&Nephew Overproof rum if you can handle it. If I had a complaint it would be WiFi not being reliable. We did not have access as promised out on the beach nor in the restaurant. This was an inconvenience for us. Also, we found mosquitoes in our room night after night. We killed several every day and although we did our part to repel them, we still woke up with bites all over. When we shared our concern with staff, they offered to spray the room. This still did not help. Mosquito netting would go a long way. Small investment. Rondel Village is a perfect location if you want to be in the middle of all the action. I had the best time ever staying here! I have to go back to Jamaica! Fantastic!!! I had a great time comparing to staying at other local hotels. Only wish it was an all inclusive. On my previous visit to Jamaica I stayed in Montego Bay at an all inclusive resort. As fun as that was, I wanted to try something a bit more reasonably priced, quieter, and closer to the locals. Rondel Village in Negril was such a good place for what I had in mind. The beach was peaceful, although do watch out for the peddlers. If you do not want anything be firm and say no, but security was very good shooing them away. Across the street was Jungle Nightclub. Open Bar on Saturdays for 20 bucks!! It can be loud so I would request a room on the beach side/ Overall my room was clean, the staff very friendly. The hotel could use a little upgrading but you get what you pay for. I would definitely go again. The room and grounds were clean and well-maintained. The staff was very friendly and accommodating. Excellent beach. The pools were small, but the water was always clean and warm. Great vacation! Have been going to Negril since 1979 and have stayed in many different resorts and our stay at Rondel Village was perfect. It was very comfortable. I liked where I was able to open up all windows and balcony doors and let the beautiful weather in or close it up and turn on the air conditioning. 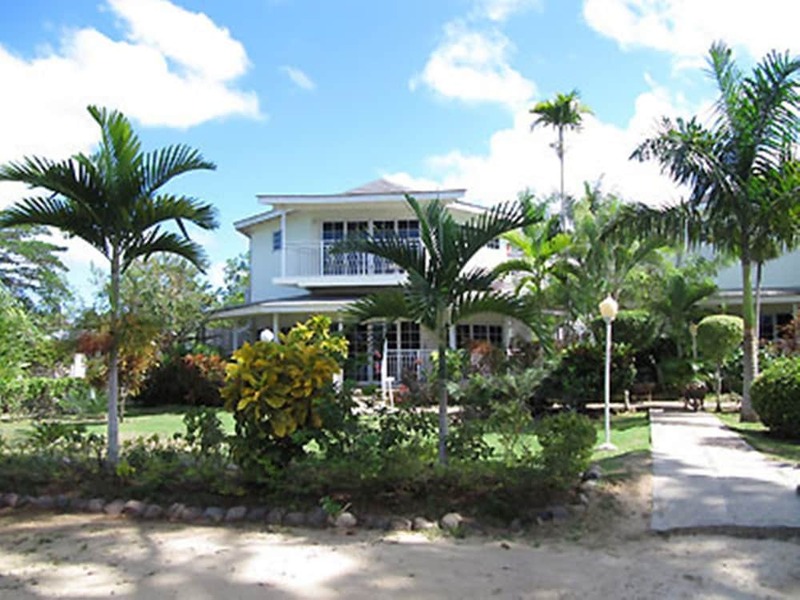 Rondel Village places you next to Seven Mile Beach and within a few miles (5 km) of other popular attractions like Bloody Bay. This 56-room, 3-star hotel has 2 outdoor pools along with a full-service spa and a restaurant. This hotel is home to a restaurant and a bar/lounge. Order from room service to satisfy your hunger without leaving your room. Start each morning with full breakfast, available for a fee from 7:30 AM to 11 AM. Guests can expect to find free WiFi and 32-inch a flat-screen TV with cable channels. The bathroom offers a soaking tub and free toiletries. Other standard amenities include a balcony or patio, a refrigerator, and a ceiling fan. At Rondel Village, guests have access to a full-service spa, 2 outdoor pools, and a spa tub. You can take advantage of free parking, along with an airport shuttle (available on request) for USD 22.00 per person one-way. Staff members can help with accommodation requests, and provide front-desk service during limited hours. Other amenities at this beach hotel include free WiFi in public areas and wedding services. Dear Wendy, Thank you for choosing us for your vacation, we are happy to know that you enjoyed your stay with us and we look forward to hosting you in the near future. I am thrilled to know that you enjoyed your vacation with us. I am sorry to know that the visitor policy did not go down well with you, the plus side of this policy is that the US$20.00 can be used for food an beverage at the restaurant for your guest. I am happy that it did not deter you from having a wonderful stay with us. See you soon. perfect spot, centrally located on the beach. a beautiful trip turned into a nightmare. We are extremely sorry about this unfortunate incident and take all complaints very seriously. When the report was received the police were immediately called to investigate. All room safes are bolted and secured inside the closet; the safes are designed only to be opened by key with an additional personal lock code feature. . The police investigation concluded that there was no forced entry to the room or to the safe and the safe itself was intact. Again we apologize for this unfortunate incident. Full breakfast is served daily from 7:30 AM to 11 AM for a fee. RONDEL RESTAURANT - Beachfront restaurant serving breakfast, lunch, and dinner. The hotel has 2 outdoor swimming pools and a spa tub. The preferred airport is Montego Bay (MBJ-Sir Donald Sangster Intl. ): 85-min drive, 47.9 mi/77.2 km. The front desk is available during limited hours. For convenient arrivals and departures, you can take advantage of the airport shuttle (available during limited hours), which is offered for a fee. Driving? This property offers free parking. This property's front desk is open daily from 3:00 PM - 9:30 PM. Airport transportation is available on request from 9 AM to 3:30 PM. Fees may apply. Guests must make arrangements in advance by contacting the property. This hotel has a beach side and a garden side. Please note that Garden Area rooms are located across the street from the beach. For more details, please contact the property using the information on the reservation confirmation received after booking.